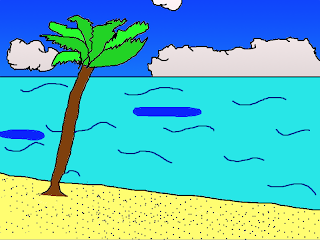 One day I went to the airport and I went to a tropical Island. I was the only one that was going to this Island. I went in the airplane and I was by my self. Me, myself and I didn't go with anyone at all but as soon as I got there, there were only 3 people but including me there were 4. So there were 2 girls and 2 boys that stayed. There were no houses and no nothing but only trees. The only thing we took was some food, heaps of water so we can drinks it and shower with it and we also took some clothes and soap there. The 3 friends were playing games and while they were playing I was minding my own business. I was eating heaps and drinking because it was so sunny and hot. I felt like having a shower but there was no where to do it. So we all spread out and I found a house with exactly 4 room. There was a shower there and also it had everything we needed. I had a nice long shower and then we went out side and played hand games. It was fun. We all went some where because after some hand games we played hide and seek and 1 of them which is Maia had to count and we all hided. I hid some other place and the 2 boys hid at the same place. Maia finished counting and she was searching hard out. When she gave up she shouted out our names but we were lost. It was freaky and scary because I was by myself and i though in my head, Lucky the boys because they are together. I went somewhere and it was a beach. It was nice but then it got dark and it was getting scary and scary every moment. I tried going back to the house but it was just to dark I couldn't see. But then felt the sand and I followed my foot steps. I got back to the house and i saw my friend Maia she was crying but as soon as she saw me she stopped and came to me. As soon as she finished crying we went inside the house and had a sleep...................It was the morning. We woke up and brushed our teeth and have breakfast. When we finished having breakfast we took some food to find the boys. We saw some foot steps and we followed it. It was 20minutes later and then we found them. We gave them the food and they were eating hard out. Maia and I told them to come with us back home because we were going to go back to New Zealand. We got to the house and we waited 1 more hour and then the plane got here and we went back to New Zealand. We had a great day.